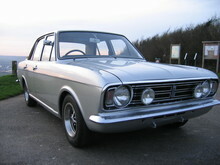 One of the best loved versions of the Cortina appeared in 1967, the 1600E. The 1600E offered a blend of sporting style and luxury with its comprehensive specification. 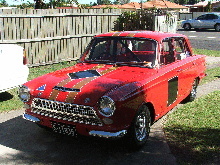 Standard equipment included sports suspension, Rostyle wheels, spot lamps, vinyl roof and metallic paint. 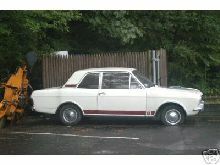 The mechanical specification included a 88bhp and 25mpg Cortina GT engine and disc brakes. 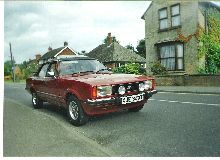 The 1600Einterior came equally well equipped and included special rear bucket seats, reclining front seats, sports steering wheel, extra instruments and a wood trim. 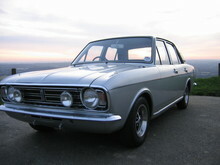 Production ended in 1970 and despite attempts at reviving the idea of an "Executive" version of other, later models, Ford never recaptured the original feel of the Cortina Mk II based 1600E. 1968 1600E (series 1) This has the "Pod" with the dials in sitting on top of the dash board. Fully restored - used recently for a wedding.